I read this article and found it very interesting, thought it might be something for you. The article is called Free Medicine For The Poor, A Southern State Shows The Way and is located at https://archive.indiaspend.com/sectors/free-medicine-for-the-poor-a-southern-state-shows-the-way. * 40% hospitalised patients get free medicines in Tamil Nadu. 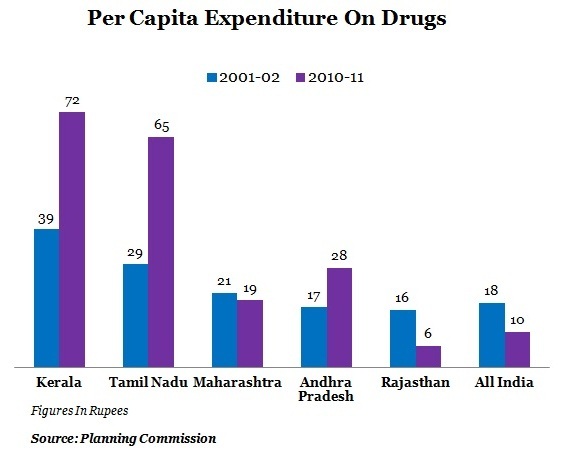 * Tamil Nadu has increased per capita spending on drugs. * 39 million Indians are driven to poverty every year because of ill-health. Drug procurement in India’s public healthcare system is severely underfunded. Two stark statistics in the World Health Statistics Report 2012, acknowledged by the Ministry of Health and Family Welfare, say it all: First, some 30% of rural India opts out of treatment because of financial constraints. Second, 39 million Indians are driven to poverty every year because of ill-health. But a drug distribution model pioneered by the southern state of Tamil Nadu through its Tamil Nadu Medical Services Corporation (TMSC) could be a harbinger of change, not just for other states that have begun implementing it but for the country as a whole. IndiaSpend’s Sourjya Bhowmick looks at the workings of TNMSC to understand what makes the programme run so smoothly and its unique features. He also finds that Tamil Nadu has the best drug expenditure as a per cent of its total health expenditure among all the states in India, the best in providing free medicines to out patients and providing free medicines to more than 40% hospitalised patients across the state. Let’s see what the Planning Commission’s High Level Expert Group on Universal Health Coverage has to say on medicine accessibility in public healthcare. Table 1: No Free Medicines ! As you can see from Table 1, free medicines for Out and In patients have come down dramatically. 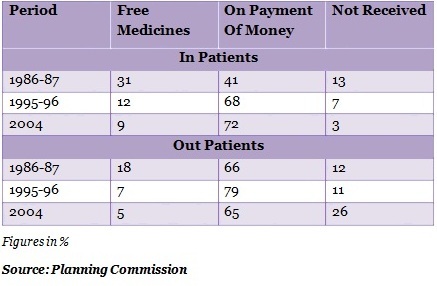 For In patients’, accessibility of free medicines has come from 31% to 9% between 1986-87 and 2004. Likewise, in case of Out patients, accessibility to free medicine has come down from 18% to 5% over the same period. 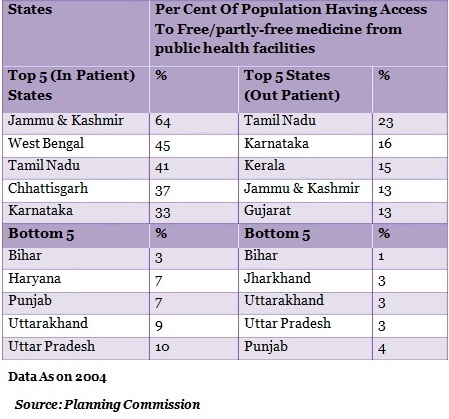 Tamil Nadu and Jammu & Kashmir are two states that lead the top 5 in free medicine supply. Lets look at Tamil Nadu closely. Tamil Nadu Medical Services Corporation (TNMSC) started functioning in 1995. It procures, stores and supplies 268 medicines, 84 suture items and 63 surgical items for various government hospitals and all the primary health centres and its sub-centres. TNMSC had purchased medicines worth Rs 170 crore during the year 2009-10. TNMSC also works on quality testing, distribution, installation of medical equipment, maintenance of medical and non-medical equipment and finalising annual rate contracts every two years for medicines. TNMSC has around 25 storage houses across the state. The Planning Commission document on Universal Health Coverage also highlights a few impediments to accessibility of medicines — inefficient financing mechanisms, high drug prices, unreliable procurement and distribution systems and widespread use of irrational medicines. TNMSC, however, sorts all this out through its well-thought out mechanism of procurement and distribution, quality certificate before releasing medicines and blacklisting manufacturers/products that fail the quality checks. TNMSC has blacklisted 39 products and 7 companies since 2009. High drug prices are generally handled by floating tenders. 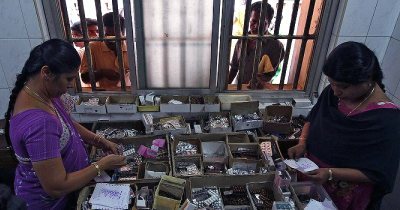 Media reports quoting the managing director of TNMSC suggest that a 15% preference in purchases is given to small companies. 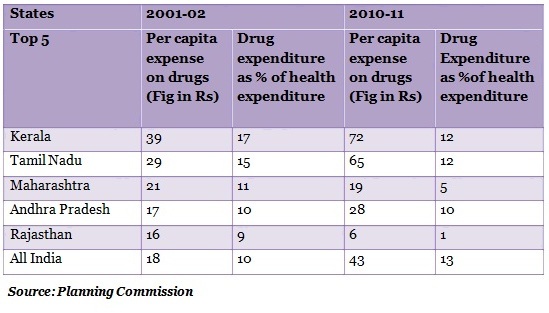 As can be seen, Kerala and Tamil Nadu are the top two states with a higher per capita expenditure on its citizens and high expenditure on drugs of total health expenditure.Incidentally, the Planning Commission has also suggested increasing public spending of drug procurement to about 0.5% of GDP from the current 0.1% of GDP. Interestingly, in developed countries like the United States, drug expenditure as a share of total health expenditure is around 10%. So, there is a worry that high drug expenditure may push other important components like primary care to the back seat. Though that may not be the case with Kerala and Tamil Nadu as both the states have good health indicators like the infant mortality rate, under- 5 mortality rate and the maternal mortality ratio. The free medicine model of Tamil Nadu has been attracting the attention of other states. Rajasthan has begun implementing it and Andhra Pradesh is testing it at some outlets in a few hospitals. Maintaining an efficient distribution system and ensuring the targeting is accurate will be always a challenge.